Data Source: Authors’ analysis of U.S. Census Bureau, 2013 and 2015 1-Year American Community Surveys, Public Use Microdata Sample (ACS PUMS). 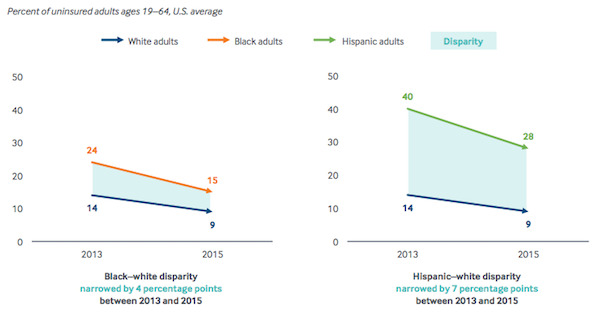 Source: The Commonwealth Fund: Reducing Racial and Ethnic Disparities in Access to Care: Has the Affordable Care Act Made a Difference? This entry was posted in Data Watch on August 30, 2017 by Genevra Pittman.